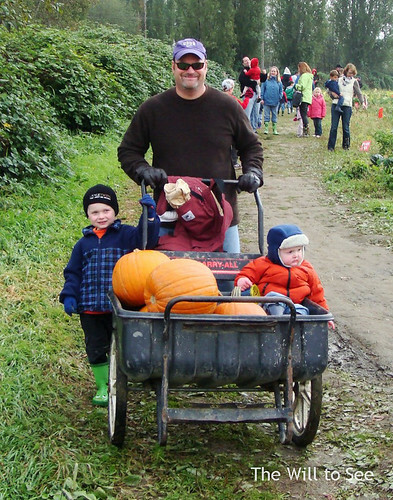 Saturday was our annual trek to the pumpkin patch at Fall City Farm. It is probably the last sunny weekend before Halloween (the forecast for this weekend looks really wet), so the rest of the Puget Sound had the same idea. Knowing this in our true family style we were there right when it opened. Having been to this patch for the last several years we knew that their cart supply was limited, so we threw the wagon in just in case (the wheelbarrow had a flat tire), but we were able to get one of theirs. Since the week had been rainy I wasn’t sure how muddy it would be, so Will got to wear rubber boots for the first time. He wasn’t so sure about them at first but I think he got the hand of it. Jack had his boots that we had gotten him for the class trip to the patch. 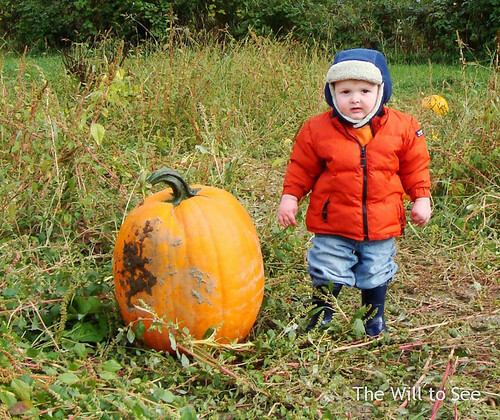 It was a chilly morning, hence Will’s big orange coat, a great hand-me-down given to Jack from some good friends. 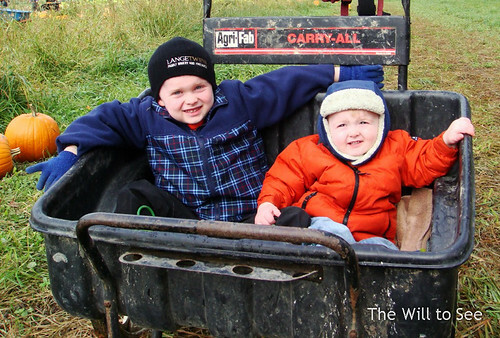 Daddy gave them a ride out to the patch in the cart. 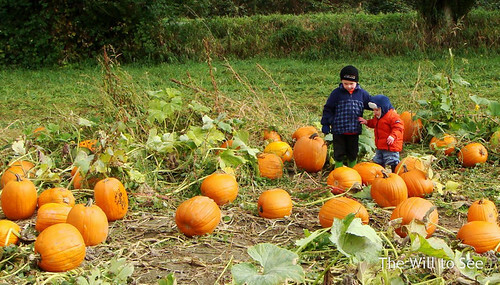 Once out there we all set out on the search for the perfect pumpkins. Jim was after the great big one. Jack looked for his favorite and Will and I tried to find a good one for him. There were a lot of really nice pumpkins and each family member got one (even Mulligan, although she wasn’t allowed to come). 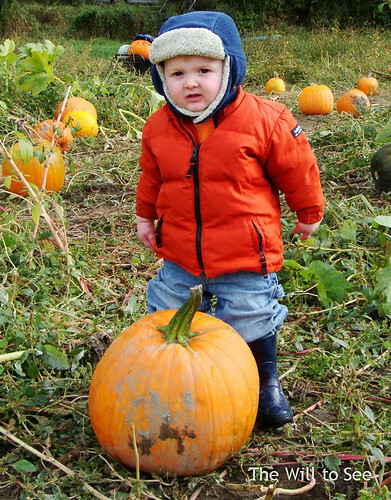 When Will, Jack and I were searching for my choice pumpkin, a tall skinny one, our first choice was claimed right before we got to it. We move slowly across the field with a 19 month old walking in rubber boots and trying not to get his toes caught on the vines. 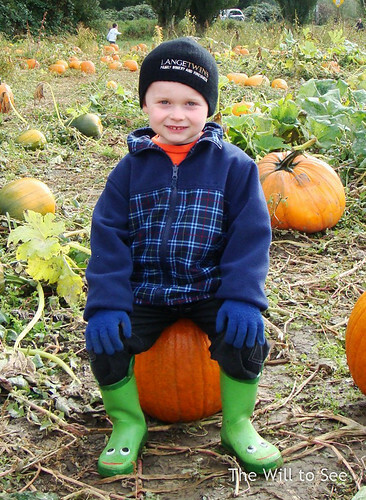 Jack was bothered by loosing the pumpkin, but we found another good one. This year we decided to scale back our number of pumpkins to 5 true carving ones (from 7 last year) and 3 little ones which probably will not be carved more due to time available than the will to carve them. As we left the patch Will loved the ride on the cart and got many comments as we headed out. Once at the car it didn’t take long before someone asked for our cart and we watch the parking lot really fill up as the rest of the area were arriving. Our pumpkins are happily sitting on the back deck waiting to be carved. Jim is trying to figure out what Husky themed drawing he will do this year. Will loves to look at them from the kitchen window. Now we just need to find the time to carve them. Seriously, nice pumpkin patch post. Looks like a Christmas card picture opportunity!